Any time a couple of mid-to-late round prospects show enough progress to warrant entry-level deals, and a team can pick up a couple of free wallets out of Europe at the center and right-defense position, it is a good day for the organization. And so it is a good day for the Toronto Maple Leafs, who announced four entry-level signings on Thursday afternoon, two from within the organization’s system and two undrafted free agent signings out of Europe. Signed to a three-year entry-level contract was 2015 fourth-round pick Jesper Lindgren, while 2015 seventh-round draft selection Pierre Engvall signed his two-year ELC. Par Lindholm and Igor Ozighanov, both free agent signings that were reported Leafs-to-be for some time now, officially signed their one-year entry-level deals on Thursday. In Ozhiganov and Lindholm, the Leafs have continued the steady stream of Spring-time additions out of Europe, with Miro Aaltonen, Calle Rosen, Andreas Borgman, and Nikita Zaitsev all added to the organization over the course of the last two calendar years. The hope is that the 25-year-old Ozhiganov, who turns 26 in October, can do a job for the Leafs in an area of need on the right side of the defense, providing the heft and meanness that they’ve leaned on Roman Polak for the past few seasons but with more mobility and offensive upside to his game, although it remains to be seen how his skill set translates onto an NHL ice surface. Known for his heavy shot (clocked at around 100mph in the All-Star Game), the 6’2, 215-pound Ozhiganov did not have his best offensive season since the reports broke that he was headed overseas – to Toronto, specifically – last summer. His two goals and nine points in 42 games, and no points in five playoff games, is his lowest offensive output since 2013-14. Prior to this season, however, he compiled 38 points – including 13 goals – in his previous 100 KHL regular season games (spanning 2015-17) and was a +34 in that time. It’s too early to project the Leafs’ defensive depth chart for next season – a lot could change through trade and free agency — but Ozhiganov is a cheap, no-risk flyer that adds depth at a clear position of need. With Nikita Zaitsev missing time through injury the past two seasons and Ron Hainsey’s age and workload, there is no doubt the Leafs are going to need to continue to shore up this area of the depth chart going into next season, both in terms of quality and quantity. 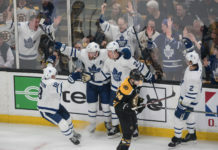 Typically, with the way Babcock has allocated the minutes, the Leafs head coach has preferred a penalty-killing element from at least one of his bottom-pairing defensemen, but a lot could change with the dynamic of the blue line as the offseason plays out. It remains to be seen if the Leafs attempt to bring Roman Polak back for a depth option on the right side. Also worthy of mention here is Justin Holl, who arguably has earned a good look at camp next year with the year he’s had with the Marlies and in his brief cameo for the Leafs. Ozhiganov appears as though he’ll be in a battle for a 6-7 spot on the roster, and how well he adapts to the small-area play will dictate how far he goes on NHL ice, like all players coming over from Europe. Par Lindholm is a signing we discussed recently here at MLHS when the news originally broke – considered a versatile, 200-foot center who has played up and down the lineup before thriving in a top-line scoring role the past few seasons for Skelleftea AIK, Lindholm will be joining the mix for a depth center role in an area of the depth chart that has a great deal of uncertainty about it beyond Auston Matthews and Nazem Kadri, with Tyler Bozak, Dominic Moore and Tomas Plekanec all pending unrestricted free agents. Frederik Gauthier is putting together a Calder Cup playoff that has put him back on the map a little bit as far as the 4C competition next Fall, but this is an area where the Leafs clearly need more depth and it should be a continued focal point this offseason. The goal this offseason for GM Kyle Dubas, in part, has to be to settle the 4C position in such a way that it does not require further sacrifice of second-round draft picks at the trade deadline. A top-five scorer in the SHL this season, whether Lindholm can be the solution there may depend on whether he’s able to tickle Babcock’s fancy when it comes to the penalty-killing and faceoff-taking element the Leafs head coach typically demands from the role. In the latter category, Lindholm did finish top five in the SHL at 58% faceoff efficiency and took more draws than anyone else in the SHL. Pierre Engvall has been a bit of a revelation since arriving in Toronto on a professional tryout and joining the Marlies down the stretch and into the playoffs. A seventh-round draft choice in 2014, the Leafs appear to have pulled a legitimate prospect out of the far reaches of the draft. Arriving at the end of a quietly impressive rookie season in the SHL (seven goals, 21 points in 30 games), the end-of-year AHL stint could not have played out any better as far as initiating the acclimation process and boosting the confidence of the player. The Marlies immediately put the 21-year-old into a position where he could get his feet underneath him and contribute on the power play, where he scored three goals in nine regular-season games. In the playoffs, he’s added three goals and seven points in nine postseason appearances while playing primarily on an effective line with Frederik Gauthier and Colin Greening, with all but two of his assists coming at even strength. Between the regular season and playoffs, Engvall has tallied seven goals and 15 points in his first 19 AHL games. Engvall brings a unique element to the Leafs’ system with his size, shot, and skill combination, which he’s begun to leverage more and more effectively as he’s adjusted to the league over the course of the last couple dozen games. He’s been a legitimate difference maker in the playoffs so far, and his role with the Marlies should only continue to grow in size and responsibility heading into next season. Engvall is an intriguing prospect to monitor as far as what his ceiling might be as he adds more strength and bulk to his frame and is leaned on more and more in key situations. Jesper Lindgren, 21 in a few days, has not been a regular feature in the Marlies lineup, partially because the organization is far deeper on the blue line than they are flush with scoring wingers like Engvall. But he’s a right-shot defenseman who is considered a capable puck-mover to go along with the heavy shot in his arsenal. A fourth-round draft choice in 2015, Lindgren is raw and is going to need continued work on his body — listed under 160 pounds (at 6’0) when he was selected – which is part of the motivation of getting him over to the Marlies’ facilities and working under their skills and player development personnel at the end of his SM-Liiga season with HPK Hameenlinna.